Efficient and easy to deploy, Falcon Structures' modified shipping containers provide a comfortable industrial housing solution where employees feel safe. Constructed of durable, galvanized steel, our modular housing solutions stand up to extreme weather and are rodent-proof. All products include climate control, fast and convenient plumbing and electrical connections, and living space where occupants can relax and sleep. We also offer a kitchenette option. The climate controlled Living Container includes two distinct spaces. One space includes the full bath, while the other can accommodate sleep, relaxation and/or dining needs. Durable, steel construction keeps residents safe from intruders and the elements. 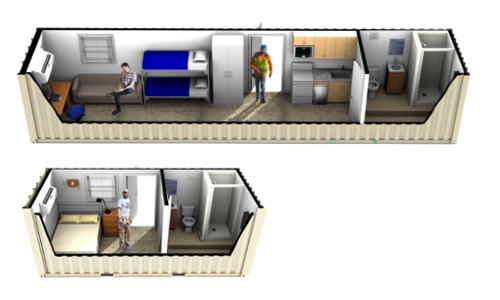 If you need two private living spaces under one roof, consider the 40-foot Jack & Jill Living Container. This floor plan includes two separate climate controlled living areas that share one full bath. Separate, locked entrances help ensure privacy.